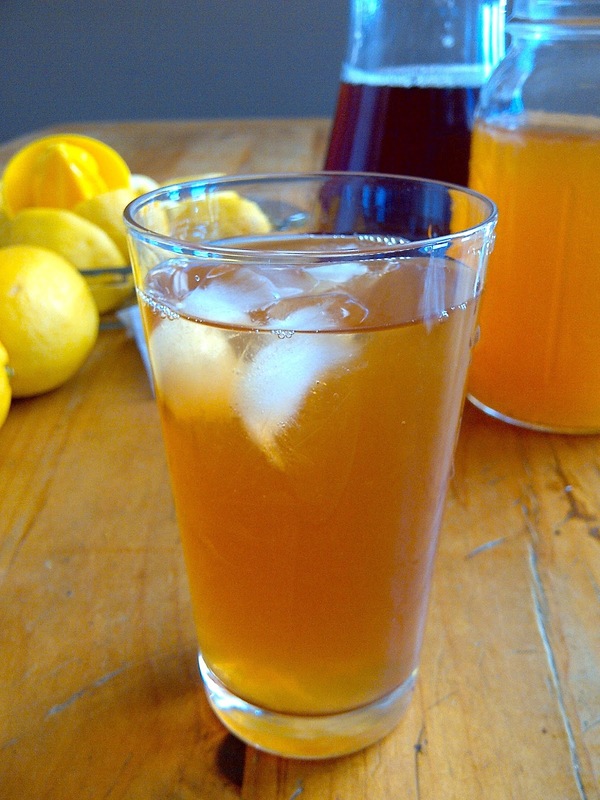 Arnold Palmer - a famous golfer who coined his favorite drink: half lemonade and half ice tea. Robert Palmer - a famous singer-songwriter who coined slicked back hair, pale faces, and heavy eye and lip makeup for the models/dancers in his music videos. So, what do these two men have in common, other than the same last name? Not a damn thing. Me, being me, always refers to the drink as a Robert Palmer, instead of a Arnold Palmer. An Arnold Palmer, AKA a half and half, is simply half lemonade, and half ice tea. It's also 'Simply Irresistible' (Click here for the music video). I used the base of my DIY Del's Soft-Serve Frozen Lemonade for the lemonade half, I just didn't freeze it. 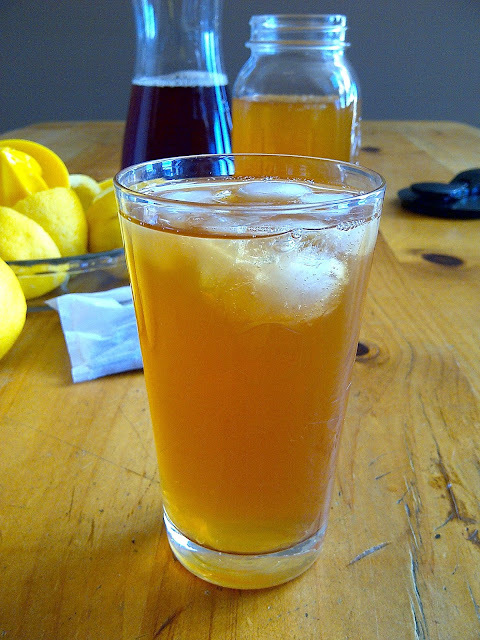 For the ice tea half, I used a fresh batch of unsweetened ice tea. Unsweetened ice tea is pretty much available everywhere throughout New England, yet no where in my part of Canada...and I do miss it so....in the winter time, 'Some Like It Hot' (great segway, no? - Click here for the music video - a great song to play air drums to, btw). We had an aunt who use to live on this tea...she would put a few tea bags into a pitcher of water, and refrigerate it overnight. The next morning it was cold brewed to perfection! Our aunt loved Robert Palmer's cover of Marvin Gaye's two songs, 'Mercy Mercy Me/I Want You'. Sadly both our aunt and Robert Palmer are no longer with us. So for our last song today, raise an Arnold Palmer in tribute to them both. (Click here for the music video). As mentioned in my frozen lemonade post, I made the lemonade on the puckery side, not as sweet as most lemonades. Just taste and add additional sugar to make it to your liking. A little New England trick? 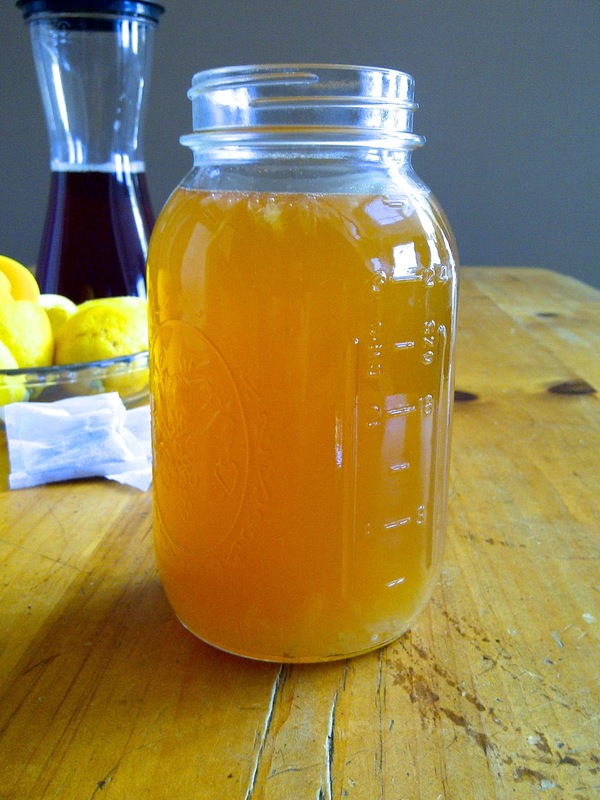 Try using pure maple syrup as a sweetener - it dissolves way better than granulated sugar in a cold beverage. Either in a large pitcher, or in individual cups, combine equal parts unsweetened ice tea and prepared lemonade. Taste and add additional sugar/maple syrup if desired. Serve with lemon wedges or lemon slices as a garnish. Steep the tea bags in the boiled water, let steep for 1-2 minutes then remove tea bags. Add the ice water and chill. Mix the lemon juice, sugar and water together. Stir well to dissolve the sugar and chill. Add additional sugar to sweeten it to you liking if necessary. Looks perfect for the hot days here in Jamaica Kim! I am addicted to Starbucks' Black Tea Lemonade, and have always wanted to try making my own at home - so I can't wait to try your recipe! Pinning it now! Thanks for sharing (saw it on Marvelous Mondays)! Thanks Kim! Hope you like it!! Oh my gosh you are taking me back. I was a huge Duran Duran, Power Station, Robert Palmer fan. And I HEART Arnold Palmers. My MIL introduced me to them. Funny thing is I never make them at home. Weird. :) I think I ran through ALL those songs on youtube when writing this post....remembered EVERY word, too!! What a great summer drink. Thanks so much for sharing! I'm pining on my summertime fun pinterest board. Right? The perfect summah time drink!! Thanks for stopping by, Laura! I've called them Robert Palmer's many times too! I will have Simply Irresistible in my head for the rest of the day! These are really good made with Iced Tea Vodka as well. Yes, I imagine that would be good. Thanks for stopping by, Kim. Thanks Claire - hope you like them! Mmmmmmmm, I do love me a good Arnold Palmer! Kim, this sounds totally delicious! Thank you so much for sharing at Best of the Weekend! Arnold Palmers are my FAVORITE! Love it! Thanks for sharing. I love the correlation between the two Palmers! And I love the drink, so refreshing. Thanks for sharing at Wicked Good Wednesdays! Good, trusty, thirst quenching AP! :) Thank you so much for linking up with me this week at Tasty Tuesdays! I’ve pinned this & shared it with my followers! Please be sure to stop back by the party and check out some of the other links! Yes! And wouldn't they love it even more if you lip-synced Robert Palmer while serving them an Arnold Palmer? I know I would! Calgary, Alberta: An Update & Brew Review!